 Front engine - rear wheel drive only.  Any 4 cylinder, single cam,2 valves per cylinder up to 2400 cc.  The only Aluminum head allowed for the Ford 2.3 engine is the Esslinger Aluminum head currently illustrated on page 8 of their online catalog, Part number M-6049-E23A.  Any Ford production/Fuel injection intake allowed.  No Dry sump oil system.  Two barrel carburetors, gasoline and natural aspiration only. No fuel injection, turbo blowers or nitro.  Max. Engine setback to be 20" from center of front wheels to front of engine block. Weight of car with driver after feature to be: Ford 2300 cc, hydraulic lifter engine -1700 lbs. With Aluminum Head must weigh 1725 lbs.  All other add .85 lbs. per cc. cc, hydraulic lifter engine -1700 lbs. 1. 1999 – 2004 ZX3 1989 cc. No SVT engines or parts. 2. Short block, Stock and unaltered. 3. Crank, rods, piston assembly to be run as delivered from the factory. No lightening or balancing. 4. Oiling system may be modified for circle track racing (pan, pickup tube, remote filter, oil cooler). 5. No dry sump oil systems. 6. Water pump impeller may be replaced opposite direction vane. 7. Cylinder head, stock valves no oversized valves, no stainless or titanium valves. 8. Stock springs, retainers and buckets only. 9. Any drop -in cam allowed. 10. Head porting allowed up to a maximum of 1 inch in from the face of the port. 11. Machining of the cylinder head to increase compression to a maximum of 11 – 1. 12. Adjustable cam gears may be used to fine tune cam timing. 13. Cylinder head may not be relieved for lobe tip clearance. 16. Absolutely no fuel injection, turbo, nitrous superchargers. 17. Any Ignition system allowed. 18. Rev limiter to max. of 7200 RPM. To be set and sealed by club. 19. Race gas allowed. No methanol allowed. The Ford Focus engine objectives is to create a reliable, competitive and cost effective alternative (not replace) to the current all-out race engine. The Pro 4 Modified Club (as a group) reserves the right to change the specs of the Ford Focus motor at any time. The cost associated to the changes is the responsibility of the driver not the club. The objectives of the Honda S2000 motor is to create a reliable, competitive and cost effective alternative (not replace) to the current all-out race engine. The engine must be totally stock with no Modifications. All components of the engine must remain in stock form. 1. Block, crank, rods, and piston assembly must be run as delivered by the factor in stock form. Absolutely no modifications or aftermarket parts allowed. Oil pan will be sealed with 2 markers to ensure that it stays stock. This to be done by Stan Pokupec and Ken Mercer prior to season . 3. Cylinder head, stock valves only no oversized valves, no stainless or titanium valves. Stock springs, retainers and buckets only. 5. Two barrel Holley carburetors, gasoline and natural aspiration only. No fuel injection, turbo blowers or nitro. 6. Absolutely no fuel injection, turbo, nitrous superchargers. 7. Weight of car with driver after feature to be: Honda S2000 is to be 1725 lbs. 8. For the Honda 2.2 litre engine it must be limited to 8500 RPM. The Pro 4 Modified Club (as a group) reserves the right to change the specs of the Honda S2000 motor at any time. The cost associated to the changes is the responsibility of the driver not the club. Any driver has the right to have the motor inspected at any time. The driver requesting the inspection must cover the cost of oil and gaskets at the time of the inspection. The cost will be set at $300.00 in the event the motor is determined legal the money is released to the motor owner. In the event the motor is found illegal the money will be returned to the driver requesting the inspection. Inspection will be performed by the club (as a group) at a predetermined time and location (including at the track).  Manual Transmission with Min. 2 forward gears and reverse.  No Transmissions with internal clutches. Clutch must be located in bell housing between transmission and engine.  Wheel base minimum 87 inches – maximum 102 inches.  Track width: 78" max. To outside of tire bulge. To be measured with no go gauge at bottom of tire.  Wheels - 13" x 10" steel racing wheels only.  Cage - 1 1/2" x .095" min., three driver’s side bars min.  No remote adjustable suspension.  Dual arm independent suspension only. One coil over per wheel.  One straight axle only. One coil over per wheel. No I.R.S.  Hoosier F-15, F-25, F-35 tires. If you have exsisting American Racer tires you can run a maximum of 2 sets for the season then you must switch to Hossier tires.  Open front wheels completely exposed.  Max. Body width 72"
 Rear deck height 35" max.  Rear spoiler height 41" max. And no wider than the body. Must be lexan if above 35".  Center of front wheels to nose max. 40"
 Nose piece and front bumper no wider than inside of front tires.  Nerf bars or body must be within 1" of outside of tire.  Numbers must be neat and clear on both sides of car. Motor size with CC and an H or S for Hydraulic or Solid Lifters. Also what car should weight to be displayed on right front Fender so it is visible for weigh in.  No titanium, carbon fibre, electronic traction control or antilock brake system.  Approved fire suit, shoes and gloves.  Approved arm restraint mandatory for open roof cars.  Quick release steering wheel mandatory.  Battery on/off mounted within drivers reach.  Drive shaft loops on front and rear of drive shaft mandatory.  If Drive shaft is not located in center of Chassis it must be completely enclosed by tube and 2 loops to ensure it cannot be ejected out on to the track in case of a crash.  Aluminum race seats only.  Approved fuel cells only.  Scatter shield mandatory must provide 180 degrees of protection and be constructed of min.3/16” plate steel for clutches located between main frame rails.For clutches located outside main frame rails there must be a 360 degree scatter shield constructed of min. 3/16 steel is Mandatory to protect driver and fellow competitors. Not required on cars with Ram Coupler. Scatter Blanket accepted.  2 throttle return springs mandatory. Head and Neck restraints recommended. Top three cars in feature must pass through tech. Tech Committee to be comprised on 3 individuals for each night. These individuals have to be independent of the car in question. I.e. cannot be part of the team that is being inspected. In order to try and keep the field competitive and fair we have introduced a one car rule. A car and driver qualify as a team. Each driver can qualify only one car. No driver will be permitted to change cars after taking the green flag of his qualifying practice. All cars must take the green flag in one practice in order to be eligible for the feature for that night. Furthermore a driver cannot change cars and move his number to that car for points gain. Whichever number the car started with for the night is what it will be scored as. The only exception to this rule is if a driver moves to another car the points will go to that car and number that was registered for the night not to his number for points gain. In the event that you cannot make it to the track due to other obligations you have the right to have a backup driver drive your car for the night. The points will be scored to your car in order to keep you in the points chase. However the backup driver will start scratch for the entire night. He will start rear of the field in both heats and Feature event for that night. Cost is $50 for back up driver. Ever driver is entitle to drop two night from the season. This allows for two bad night or a night that you may not be able to make it. The points drop will happen 3 races before the end of the season. This means that the last 2 races of the season there is no mulligan left. Everyone will know where they are in points and the last 2 nights are final points. the race. DNF points are awarded by finishing order. If you go out first then you are awarded last place points. If other drivers are already off then you will be scored accordingly. Feature #1. This line up will be set by the drawing of a number when signing in. The Pro 4 Modified Club (as a group) reserves the right to inspect any and all cars at any time. Any cost associated with changes to bring he car up to club spec, safety rules is the responsibility of the driver not the club. 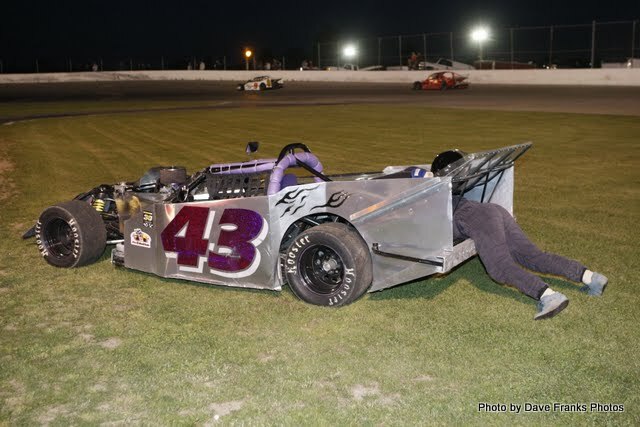 The Pro 4 Modified Club (as a group) reserves the right to change the rules at any time throughout the season in the interest of fair competition. If a majority of members vote to change a rule the expense of the change is the responsibility of the car owner not the Pro 4 Modified Club.